The north-south divide is opening up again, as unemployment hits hardest outside London. But firms like Sage in Newcastle prove there's life in the regions yet. The latest unemployment figures show that the number of people out of work now stands at 8.3% of the working population - the highest rate since 1996. But in the North East it’s far higher - 11.6% are unemployed, almost double the 6.3% unemployed in the South East. The number of people out of work in the region rose by 20,000 in the last three months. Once a major industrial hotspot, the North East’s manufacturing status has declined over the last 40 years as production moves east to take advantage of low wage emerging economies. And as a result of many subsequent years of government regeneration plans, it also has a heavy concentration of public sector workers, who were hit hard by the spending cuts this year. 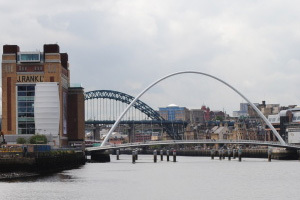 Nevertheless, the private sector is still holding its own: the region is home to some big businesses, including transport group Arriva, bakery chain Greggs and of course accountancy and CRM software specialist Sage - one of Newcastle’s biggest employers, with 1,613 staff at its headquarters in North Park. Sage, celebrating its 30th birthday this month, is a genuine home grown Tyneside success story, founded in the Toon in 1981 by three local entrepreneurs. And despite growing to a £3.5bn company with more than six million customers globally - it operates in 24 countries – Sage’s headquarters have remained firmly in its North East homeland. Within those grim unemployment stats lies another grimmer truth – that young people are bearing the brunt. Youth unemployment has just hit the million mark. Firms like Sage have a vital role to play in tackling this issue, offering as it does genuine career progression. From starter jobs in its contact centre, where 500 staff field 7,500 calls a day from customers, Sage can provide ambitious and capable school-leavers a real chance to climb the ladder. And the same is true of those leaving higher education – the firm has close links with local colleges and Universities and sources many skilled programmers and developers that way. No wonder demand is high. For 12 positions in the contact centre this year, Sage had 356 applications; for one developer role, more than 100 people applied. An apprentice scheme is under consideration. And Sage must be doing something right – its software makes sure that a quarter of UK employees’ get the right pay on the right day, and there are Sage customers in every postcode in the UK. As public spending cuts continue to hit regions like Tyneside harder than elsewhere, the role of dynamic private sector employees like Sage in their local economies will only get bigger. ‘There isn’t any other comparable employer to Sage in the North East. It has a global reach but chooses to be based in Newcastle. That should give confidence to other businesses and show there is a good skill set here,’ Rowland says.